Last week we talked about the Ratcatchers, the Disease condition, and the genesis of the concept for Minor Guilds. Today though, we’re going to take a look at Skulk, the first Ratcatcher to be revealed, as well as a brand new player, Pelage! As many of you may know, Skulk was originally created as a result of the ‘Design a Model’ seminar series from SteamCon UK 2016. The sculpt we made that weekend was given away as part of the attendee welcome pack for SteamCon UK & US 2017 as a limited-edition miniature. However, we also gave you his final rules card to play with, since Skulk can play for the Mortician’s Guild as well as the Ratcatcher’s Guild. Let’s take a look at what makes this guy tick. I’m going to cheat a little here and skip ahead to a small but important detail on the back of Skulk’s card, since that detail makes the front of his card make a whole lot more sense! Skulk is a goalkeeper. This means that he specialises in ball control and helping to prevent the enemy team from scoring goals, or at the very least make it very difficult for them. One of the first places we can see this being a strength is in Skulk’s Playbook. With a strong TAC of  Skulk rolls a decent number of dice when attacking enemies, and only requires  net-hits to reach that Tackle result on his second column. Retrieving the ball is made all the easier by Skulk’s [2”] melee zone which allows him to attack enemy players with a [1”] melee zone without having to worry about potentially harmful Counter Attacks. A Momentous double Dodge on his second column is another incredibly useful result for someone mainly concerned with moving the ball around, it could even help Skulk score the occasional goal himself! Next we come to Skulk’s Character Plays, the first of which is one we’ve seen before on Compound, Horrific Odour. This is an incredibly potent ability when playing against enemy teams that love to move the ball around and rely heavily on goal scoring. Making an enemy player have to spend  additional Influence just to kick the ball is a huge problem when the enemy coach is also having to consider how much Influence they need to spend on sprinting into position or attacking to generate Momentum. If the enemy team needs to complete several passes to make a goal happen, they may trigger Horrific Odour more than once, since it applies to every kick that the enemy makes within the aura! Additionally, one of the best things about Horrific Odour is that it isn’t tied to Skulk’s proximity to his friendly goal-post. If you’re feeling really mean you could sprint Skulk into the enemy half of the Pitch and it would have just as much effect! As well as Horrific Odour, Skulk also has a brand-new Character Play called Pest Control. While Horrific Odour has a huge range, Pest Control only effects enemy players that are within Skulk’s [2”] melee zone. While within Skulk’s melee zone the enemy suffers a reduction in both kicking skill and range, since the enemy player’s dice pool is reduced by [-1] for Pest Control and an additional [-1] for making a kick while engaged. Since you could have Skulk use both Horrific Odour and Pest Control, this has the effect of telling the opponent that the closer to Skulk they get, the worse it gets for their strikers! The reverse of Skulk’s card shows just how different Skulk is to most other goalkeepers. Instead of standing as a silent guardian in front of his goal-post like Tenderiser & Compound, Skulk can roam more freely up into the middle of the Pitch when his team needs him to. Follow Up is a great example of this, showing that Skulk is at his best when engaging enemy players and making use of Pest Control and Horrific Odour. Skulk is a nightmare for enemy strikers, if they try to escape Skulk will just run straight after them and carry on being a pest! Lightning Reflexes is another Character Trait which allows Skulk to stay engaged with an enemy striker. A brand-new Character Trait, Lightning Reflexes is one of the first effects in Guild Ball that triggers from enemy players making a Dodge movement. Normally, Dodge movement is the safety net of a striker or other goal scoring player. Dodge movement normally allows players to escape enemy melee zones without suffering Parting Blows, and even gets around Follow Up since that Character Trait triggers when an enemy player makes an Advance. However, having both Follow Up and Lightning Reflexes means that Skulk can follow an enemy player whether it makes an Advance or a Dodge! Goal Rats is the single ability on Skulk which he only benefits from when stood close to the friendly goal-post. When an enemy player takes a shot at Skulk’s goal-post, if they miss (which is more likely if they’re being affected by Pest Control!) then after the kick-scatter is resolved, if the ball is in contact with Skulk’s goal-post, Skulk gains possession of the ball. This represents a small swarm of trained rats following Skulk around and bringing him the ball when it falls near them. Definitely helpful for capitalising on Skulk’s other abilities and recovering the ball! Skulks final Character Trait is one we have seen before, Poised. A lot of Skulk’s rules are designed to make him a pain for enemy strikers once Skulk gets engaged with them. Follow Up and Lightning Reflexes make it very difficult for them to escape Skulk’s melee zone and Poised makes it risky to even attack him. Skulk’s solid TAC  is useful here to Tackle the ball from an enemy player. If Skulk gets a little lucky and rolls three net-hits he can activate Pest Control from the third column of his Playbook. Alternatively, if Skulk is in danger of being taken out he can try to hit the double Dodge Playbook result on his second column to try to escape the enemy player’s melee zone. The evil side of me loves to see coaches struggling to get their strikers free from Skulk, like the moment they realise that old tricks like Where’d They Go? won’t allow them to easily escape from Skulk’s grasp thanks to Lightning Reflexes. Or even making an attack against Skulk only to have Skulk Counter Attack and activate Pest Control, making their goal run even more desperate. Now that we’ve taken a good look at where the Ratcatchers came from, it’s time to look at where they’re going. We are proud to finally introduce you to the Dark Seductress, Pelage. She is the second dual Guild player included in the Ratcatcher’s Guild box, meaning that she can play for both the Ratcatcher’s Guild and the Mortician’s Guild. It’s fair to say there is a split between wanting to take enemy players out and score goals with the Ratcatcher’s Guild. No such split exists in Pelage however, she’s fairly single-minded in purpose. If something is stood in front of Pelage she’s going to kick its teeth in and look completely badass at the same time. Pelage is one of the team’s dedicated damage dealers. Although she may not look it at first, Pelage is thoroughly at home in the middle of a fight; her DEF [5+] can make it difficult for enemies to land heavy damage onto Pelage. Don’t be fooled by the very low amount of health, , that will make way more sense later on. On her Playbook Pelage has the option for a Momentous  damage and a Momentous  damage, but what really makes Pelage’s Playbook sing is her Character Play. Singled Out isn’t unique to Pelage, but it’s incredibly useful for any team wanting to land savage blows on the opposition. The Playbook trigger is only on Pelage’s second column, meaning in a lot of situations it shouldn’t be too difficult to hit. Once she does, Pelage is much more likely to consistently hit those Momentous damage results. While the front of Pelage’s player card may lead you to believe Pelage is a run of the mill damage dealer, the reverse of her card reveals just how unique she is. Firstly, we have Pelage’s ‘dilemma’ mechanic Cloak of Rats. 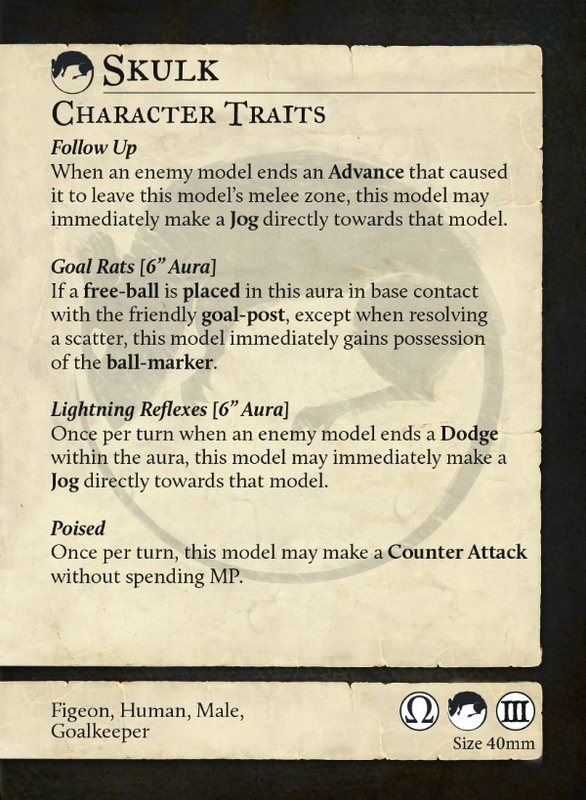 Dilemma mechanics are new to Guild Ball and specific to the Ratcatcher’s Guild. Dilemma mechanics will activate when the Ratcatcher coach wants them to, however, each one gives the opponent a choice between two different effects. These effects are always bad for the opponent; there is absolutely no way a dilemma mechanic can backfire on the Ratcatcher coach. Using Cloak of Rats as our example, this Trait triggers at the end of Pelage’s activation and affects all enemy players within its [2”] range. The opponent chooses whether Cloak of Rats will inflict the snared condition, or  DMG; the chosen effect is then applied to all enemy players within [2”] of Pelage. There are some quite deep tactical implications to dilemma mechanics and how to get the best out of them. It falls to the Ratcatcher coach to know when and how to use dilemmas in order to get the most from them. Generally, it’s a good idea to use a dilemma mechanic when you can force both options to be really bad for your opponent. To take Cloak of Rats as an example again, if you catch an enemy player that is on  Health Points or less, they obviously won’t want  damage since that will result in a take out! However, they also won’t want the snared condition since this could lead to the player being taken out very easily later in the turn (or early next turn). Pelage’s second Character Trait is the one that is most relevant to her low Health Pool of , Dark Allure. As simple as it is powerful, Dark Allure will make coaches who normally rely on generating momentum from causing damage think twice about attacking Pelage at all. Generally, in Guild Ball it’s always a good idea to try to generate as much Momentum as possible. In order to take out Pelage an opposing coach has to accept that almost any Influence they invest in causing damage to Pelage will not generate any Momentum at all. This is great for Ratcatcher coaches since it presents another dilemma to the opponent: ignore Pelage and allow her to cause a lot of damage to your players; or invest Influence in taking her out and accept that you’re not generating much Momentum this turn. Pelage’s next Character Trait, Grim Caress, complements Cloak of Rats and Dark Allure very well. Enemy players already don’t want to be near Pelage since she causes a decent amount of damage in melee, causes more damage or the snared condition due to Cloak of Rats, and enemies get very little reward for damaging Pelage in return. Due to Grim Caress, if the enemy is too close to Pelage and they fail to escape, or if they try to take out Pelage and leave her on the Pitch, their punishment for failure is a further  damage. Pelage’s final Character Trait rounds off her capacity to deal damage quite nicely, Killer. Killer increases Pelage’s Playbook damage when attacking enemies of the specified type, which in Pelage’s case is [Male] enemies. This will often mean that when Pelage hits those Momentous  and  damage results on her Playbook, she will actually inflict  or  damage! Overall Pelage is a nightmare for enemy teams planning to score points through take outs. For the opponent, at best she is going to mess with their Momentum generation for a turn or two, at worst she could take out a player or two and cause another few players to also suffer heavy damage. And the rather sneaky thing is, even just messing with the opponent’s Momentum generation is huge for the Ratcatchers, considering the Disease condition and thus the increased cost of recovering health for your opponent. From the perspective of a Mortician coach, there are a huge number of ways they can take advantage of several of Pelage’s abilities. The Mortician Captain Obulus already exerts a significant amount of pressure on an opponent’s ability to generate Momentum due to his Legendary Play Rigor Mortis, Pelage compounds that issue thanks to Dark Allure. The Singled Out Character Play is also enormously useful to the Morticians in general, who have a slightly heavier reliance on take outs than the Ratcatchers. The need to inflict take outs is another reason for Mortician coaches to consider Pelage, since she brings a significant amount of damage dealing to the Pitch. That’s all for today! Join us again in our next Ratcatcher blog to read all about Scourge, the Pestilent Abomination.